Perodua to display concept car at KLIMS - new SUV? Home » Cars » Perodua to display concept car at KLIMS – new SUV? Perodua to display concept car at KLIMS – new SUV? The 2018 edition of the Kuala Lumpur International Motor Show (KLIMS) is just around the corner now, opening to the public on November 23 to December 2. 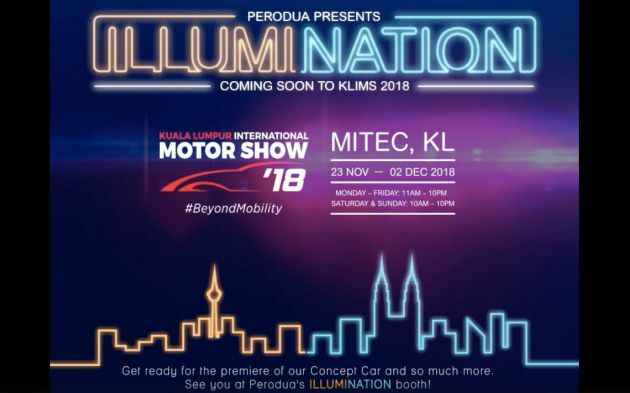 As the Malaysian auto market leader, Perodua is sure to be there, and the company’s booth theme is “Illumination”. Perodua has just opened registration of interest on its social media pages, and the caption reveals that there will be a concept car displayed at the show. “Let’s get ready for the premiere of our concept car, technology innovations and more! See you at Perodua’s Illumination booth!” it reads. Now, it has been widely speculated that Perodua is readying a new model, but the rumoured seven-seater SUV is unlikely to be launched at KLIMS, according to Perodua Sales MD Datuk Dr Zahari Husin himself. However, it would be strange if the company did not make use of a big public event to preview the new model, which is likely to debut early next year. The concept car in question could either be a nearly finished version of the upcoming new model or something else altogether – something more exploratory and worthy of the concept car tag. We’re guessing the latter due to the fact that the rumoured new SUV would have been finalised by now. Previous teasers from P2 in concept car form include the Perodua GMA Space Concept (KLIMS 2013, turned out to be an accurate preview of the Axia’s cabin), the Perodua Buddyz Concept (also KLIMS 2013, looks like an early Bezza idea), and the Perodua Concept X from 2017, which could yet be an early preview of the new SUV. In any case, there will be no shortage of interesting metal (and/or clay) at Perodua’s KLIMS 2018 booth. No wonder still no price revealed for Proton x70…they just wanna wait Perodua SUV price first and hoping to hijack it. Nice try but it will fail too. Rakyat still trust Perodua more. Proton no concept car at KLIMS? Why? The 2010 Bezza Concept, Myvi Sport, Kenari Hybrid. Yeah they were interesting, but weird tbh. IF Perodua comes out with a SUV, the Proton X70 can tutup kedai. Malaysians rather buy a SUV with a Toyota/Daihatsu engine that has recognition in 200 over countries worldwide and time tested quality. Geely X70 engines can only sell mainly in China. Completely rejected by all first world countries. Now they trying their level best to market it using Proton’s name. Oh no, not another deathtrap! P2 only tumpang glamour Toyota/Daihatsu. Then the brits are so stupid by using geely car as their taxis? Why need concept car if keep rebadging? yeay! more plastics! sub-par features! so called “own design”! I will get it as I cant afford other choices! that is mostly why their sales are high! yeay! notice there is nothing much post on Toyota Rush, thus there more uploads on Perodua new SUV. Surely the new Perodua model will comes with interior mood light. But P2 has no skills whatsoever except rebadging since Day 1. Perodua car has its own DNA from Toyota and Daihatsu. That’s why people prefer their car. In term of engine and gearbox while chassis. It’s all from Perodua big brother. That’s the reason Malaysian prefer Perodua. For Proton, if they willing to have a technology and go back time during 90s and adapt Mitsubishi technology until this day. I believe Proton will not become bad apple. At least they have Japan tech which make people to trust. True, pipu buy poo2 coz it is blardy cheap until a blardy temperature gauge also don’t have in all of their model lineup. ride the big bro’s name all the way! in return receive downgraded tech! more plastics! big bro get the name, little step bro get lousy sub-par product! but never mind! as long as Malaysians cant afford other brand(s), sale will keep on increasing! Nak beli pon pikiaq 100 kali…. Macam bezza…..model sedan yg design cukup2 makan…..
Orang Malaysia…ada yang cerdik2 bole design la…. so the SUV also bontot tongek? Which Geely model used as taxi there?